Would you like to light a fire on wet wood? Do you want to light a fire on water? Are you looking for something to help you stay warm while camping, backpacking, snow-shoeing, skiing, etc? If you answered yes to these questions, look no further. We have just the product for you! Check out our hottest new product at Survival Superstore! Insta-fire can be a great solution for your outdoor fire-starting needs as well as your everyday needs like BBQ. And don't forget to include them in your 72 hour kits. 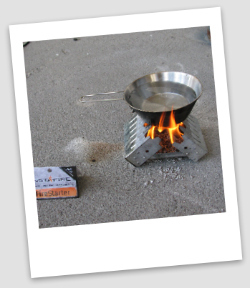 Insta-fire is a great compact addition for your emergency and disaster survival that could make a world of difference in those situations. Check out these videos by the creators of Insta-fire. Insta-fire is currently available in store only. If you are interested, please contact us at the store (click here for our contact information). You can send us an e-mail or call us and order it over the phone. Ask for Jim or Mechele.